In 2012, The Tinman Gallery in Spokane put on the Peter Pan Invitational. 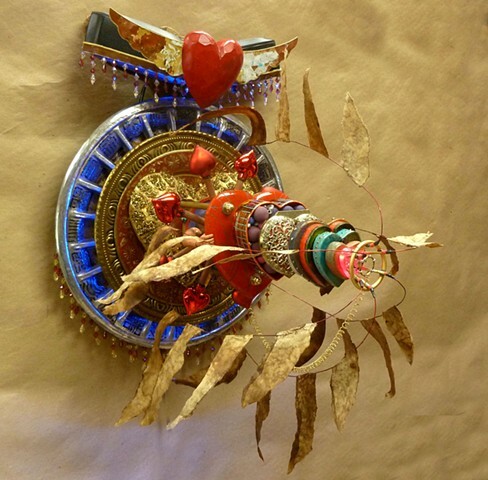 In response, I created a piece using different heart-shaped objects I had been collecting. Originally I thought the piece would sit on a table with the hearts stacked up. But at the point where the first small stack was fastened together, I tried lifting it up and holding it in space. At that moment the idea of the mounting, sound, speakers and lighting all came together. I composed a soundtrack based on the ticking of a mantle clock, layering it with synthesized musical sounds and effects, I hope to have audio with this window here on the website soon. The sound comes from speakers at the top behind the flying heart. Lights at the front, smallest heart seem to blink in time to the soundtrack. While I'd planned to use wires that would seep from the front to the back, when I completed them they were barely noticeable. That's how the "fins" came to be. They are simply used coffee filters paper mache'd to the wire. It even surprised me?